Molly Lefebure was a young journalist in London when she was tapped to become the secretary for forensic pathologist Dr. Keith Simpson during the years of World War II. 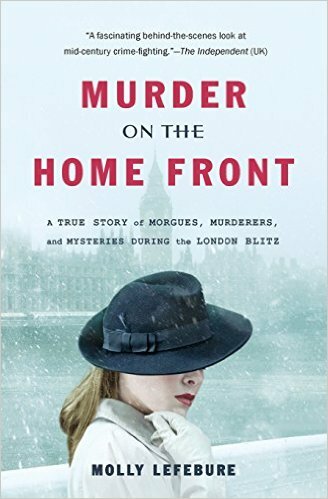 She details her experiences, including some involvement with famous murder cases, in Murder on the Home Front. As the secretary to Dr. Simpson, Ms. Lefebure was required to attend autopsies and visit crime scenes in order to take notes. Often, she apparently lugged along a typewriter to do her work. Some of the interesting cases she helped with were the Dobkin murder (where the murdered woman was first mistaken for a bombing victim), the Luton Sack Murder, and the pitiful case of poor Joan Pearl Wolfe, who lived in a "wigwam" in the woods and was bludgeoned to death by her Canadian soldier lover. Ms. Lefebure doesn't seem at all bothered by death, bodies (no matter what condition the unfortunates are found in), dismembered limbs, etc. but she's very judgmental of the behavior of the people who end up the victims of violent crime. In one chapter, she mentions a "not very interesting" murder of "a girl of fifteen and a half who had already given much trouble by running around with men" (easy to read between the lines that the teenager was just asking to be murdered and how boring it all was). Then there's the case of the young soldier who commits suicide, apparently because of the shame he felt at having been diagnosed with a venereal disease. The author laments "if the soldier had been a young middle-class intellectual, instead of a respectable working-class boy" he would have been able to shrug off the experience. She further demonstrates her lack of sensitivity when she describes Rachel Dobkin, who was murdered by her husband, as being a "poor, stupid, inoffensive little woman." There are also plenty of shocked comments on the state of some houses (as a result of the housekeeping practices, not the because of the crime scenes) she visits. The book begins with an editor's note stating that some passages were edited for this edition. I shudder to think what was left out when sections like those mentioned above were allowed to stay. While the book was originally published in the mid 1950s, when attitudes were apparently very different to the sensitivities of today, it's still rather shocking to read how little sympathy Ms. Lefebure had for the victims. Still, I suppose it takes a tough exterior to be able to work around such tragic and upsetting scenes, so maybe she wasn't as unfeeling and dismissive as she appears.